Our clear plastic mailing tubes are stocked in several sizes for immediate delivery. Vinyl caps fit securely on transparent tubes with no additional fastening necessary. Vinyl Caps are stocked in Black and Red, but other colours can be produced. Due to their unique shape, our clear mailing tubes get opened first and your message is read! 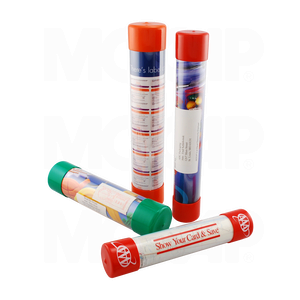 Get the immediate attention of your audience by enclosing your next mailing in our plastic mailing tubes. Weatherproof and durable, our vinyl caps are the suggested closure for our clear plastic mailing tubes. These caps are stocked in black, but other colours are available if time permits. Produced using our heavy wall clear plastic tubes, customisation of the diameter and length is also an effective way to create that special mailing. These clear plastic mailing tubes are stocked in several sizes for immediate delivery. Royal Mail and UPS approved. Plastic tube and closures offer water resistance. Caps fit securely with no additional fastening necessary. Caps are stocked in Black and Red, but other colours can be produced, subject to minimum production quantities. In this day-and-age of excessive mail (particularly junk mail), Cleartec’s clear plastic mailing tubes provide an ideal, eye-catching solution for posting promotional literature or product samples.